She said any prolonged uncertainty would have a "negative impact". Speaking at the World Bank and IMF Spring Meetings in Washington, Ms Lagarde said: "If there was a prolonged uncertainty, we can suspect that the impact on confidence would continue because, you know, whether you're talking about investors, whether you're talking about decisions as to where to expand where to set up how to organize a supply chain, people are going to wonder, you know, what comes next and and how will it settle? "So it would have a negative impact, no question about it. " Revealing her personal insight, the IMF managing director said the Brexit process was "very, very concerning on the one hand and very sad". "I grew up across the Channel and in the city of Le Havre, and to me being able to go across to Southampton, in an easy and unhampered way, was wonderful." 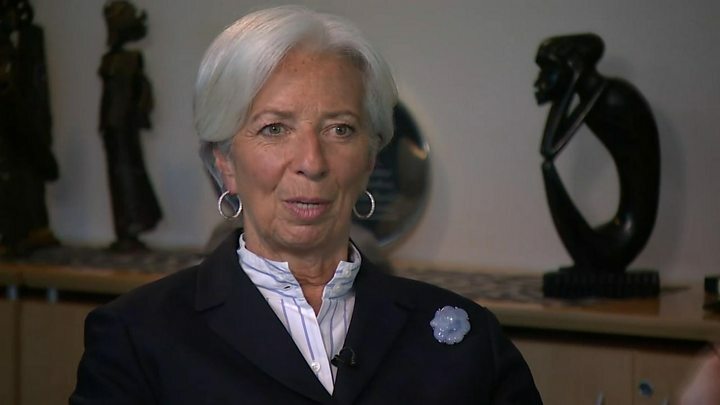 Ms Lagarde told journalists that "Having my positive hat on it removes the risk of the no-deal Brexit on April 12, so at least the UK is not leaving on April 12 without a deal. "We believe that the no deal Brexit would have been a terrible outcome." It said it hoped to see a rebound in global growth later this year but admitted that was "precarious".